Acrylonitrile-butadiene-styrene (ABS) is the largest-volume engineering thermoplastic resin, offering an excellent balance of heat, chemical, and impact resistance with superior processing versatility. Large-volume applications for ABS resins include appliance parts, electronic/electrical, and transportation (automotive) end uses. ABS resins are frequently used in polymer blends for many different applications, to achieve the best of all properties from the combined product. China continues to drive the ABS resin market, with more than one-third of global capacity and more than half of global consumption in 2017. The migration of the manufacturing of electronic/electrical, appliances, and other markets to China over the years has resulted in increased ABS demand in the country. The appliance market in China will continue to grow as the middle class population grows, since this emerging group purchases more durable goods that use ABS resins. 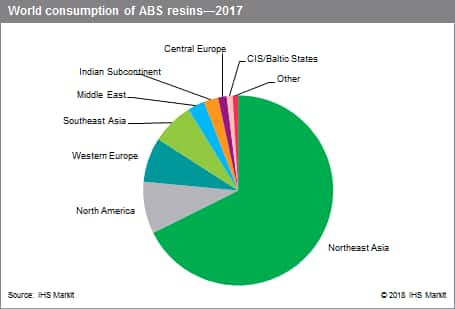 World consumption of ABS resins is led by appliances and electronic/electrical applications, accounting for more than two-thirds of total world ABS resin consumption in 2017. The next-largest end use for ABS resins is in the transportation sector (automobiles). Chinese demand for ABS resins has expanded over the years and continues to drive global capacity for the product. The next five years look more promising in terms of demand, with an estimated growth rate of about 4% per year. Western Europe, the United States, and Japan are mature economies, exhibiting slower annual growth rates over the next five years. Consumption will continue to be led by the Northeast Asian countries through the forecast period. China is expected to represent about 65% of the additional volume of consumption in 2022; the Indian Subcontinent, the Middle East, and South Korea are also expected to have strong growth. Northeast Asia is the largest importer and exporter of ABS resins in the world. Exports in the region are led by South Korea and Taiwan, which together accounted for 72% of the total in 2017. The main importing country is China, which was the recipient of most Northeast Asian imports and accounted for 50% of total world imports in 2017. In the next five years, as Chinese demand grows, Asian exports directed toward the West will drop slightly and export opportunities will diminish for North America and Western Europe. The ABS resin market is currently oversupplied. Global capacity increased more rapidly than consumption during 2012–17; this resulted in a drop in operating rates. However, stronger demand prospects and a lower capacity addition rate during 2017–22 are expected to improve global operating rates by 2022. Over the last five years, North America and Europe have seen some consolidation and capacity rationalization as demand growth has slowed. The number of producers in the Asian market has also increased, which has resulted in a more competitive market and excess capacity.